I was originally planning to take part in this year's Barnsley JOGLE (John O'Groats to Land's End in 24 hours in a Morris Minor), but it was cancelled due to lack of interest, so I decided to do the LEO (Land's End to Orkney) rally that Bill had been plugging on the MMOC forum instead. In hindsight I really needed the extra couple of months this gave me to get Fenchurch back on the road and prepare her for the trip. I finished reassembling her on the 18th of July and almost immediately took her on a 300 mile round-trip to Leicester. Nothing fell off, but I did discover a few leaks in the heavy rain and learned how to demist the interior of a Traveller without the aid of a heater. Over the next few weeks I worked until late every night fixing problems and fitting improvements such as electronic ignition, an instrument panel, and a stereo. One of the things I didn't get around to doing was checking the condition of the fuel pump points or repairing my spare pump. Tuesday the 7th of August 2007 dawned and I was feeling pretty nervous. The only road trip I'd done of a comparable length was in a modern car and spread over several more days, and the furthest I'd driven a Minor in a day was about 150 miles. Everything was packed and ready, including a load of camping gear, a big crate of spare parts, and another crate full of tools. After dithering about for a few hours, doing things like burning MP3 CDs to play on the journey and trying to decide on the best route, I eventually got going at 10AM. My objective was to get from my home in Burnley down to Cheddar Youth Hostel. The quickest route would be to follow the M65, M6 and M5 motorways all the way to Bristol, but I prefer more scenic roads so I left the M6, followed the M56 to Chester, drove all the way down through East Wales on the A49 (via roadworks and a crash that closed the road shortly after I got past it), and crossed the Severn. On the way I stopped to retard Fenchurch's ignition timing slightly because the idle had gone from slightly lumpy when I set off to very lumpy indeed (I had been playing with it in the few days previous, trying to set the optimum amount of advance by searching for the point at which it started pinking under load). After crossing the Severn I got slightly lost on my way to Cheddar and found myself near Bristol looking at a sign for a toll bridge. I correctly surmised that this must be the Clifton Suspension Bridge, designed by Brunel early in his career but not built until after his death. Always a sucker for impressive feats of engineering, I soon found myself spilling coins all over the floor as I tried to find fifty pence so I could drive over the Avon Gorge. I was now on the wrong side of the bridge for my destination, so I turned around and searched through the coins scattered around the floor to find another 50p so I could get back across. I then got a bit lost again (the area south of Bristol seems to be rather short on road signs and safe places to stop and read a map), and ended up taking a back road from the A370 to the A37 that was evidently used as a rat-run by local commuters. During the rush hour. I eventually reached Cheddar itself and was surprised by how tiny the place is. The Youth Hostel was OK and not overly crowded, but the car park was rather full (this proved to be a common problem on the trip). Wednesday's objective was to get from Cheddar to Penzance. The obvious route was to follow the M5 and the A30, so I instead set off to follow the length of the A39 around the North coast of Cornwall. I'd never heard of Porlock Hill and I had a naive Northerner's notion that Cornwall doesn't have much in the way of hills, so it came as an entertaining surprise to find myself driving up and down 1:4 gradients and around hairpin bends. Descending in first gear on engine braking alone is particularly fun in a Morris Minor due to the exhaust configuration. RARRRRRR!! Before I went to Penzance, I thought I'd go and see Lizard Point so I could say that I'd been to the most southerly point of Great Britain, and while I was down on the Lizard peninsula I stopped off at Goonhilly Down Earth Station to have a look at the radio antennas. I was saddened to learn that BT is in the process of decommissioning them and is going to demolish them all apart from the oldest one, Arthur, who is a listed building. After Goonhilly I went down to Lizard point (the most Southerly point of Britain) and took a few pictures there. It was starting to get a bit late so I pressed on to Penzance, where I found a sign on the entrance to the road that went past the Youth Hostel saying "Road Closed at [some place I'd never heard of]". The road wasn't blocked though, and cars were still using it, so after stopping to have a look at my map and see if I could find an alternative route (there wasn't, as far as I could see), I took a chance and ignored the sign. The hostel itself wasn't brilliantly easy to find because after the Hostel sign the road split into three tracks and the directions didn't say which one to take (for reference, it's the leftmost one, and the hostel is about a hundred yards up the track on the left hand side). When I got there I found the car park was almost completely full with cars and coaches, and a rather frazzled looking warden was dashing around telling the coach drivers where to park. He asked where I was going next and when I told him he sounded a bit miffed that I wasn't staying in Cornwall for a few days. By the time I'd checked in I was running late for the pub meeting we'd arranged with the other members of the rally. As I left along the same road I'd come in on, I found that a large road crew was in the process of setting up their machinery, and where previously there had been a "road closed ahead" sign that everyone was ignoring, the entrance to the road was now blocked off with cones. I bypassed the cones and carried on to the pub, where I met up with Neil, Victoria, Onne, Lesley, and Bill. Two locals - Steve, and his wife whose name I have unfortunately forgotten - had come out to meet us in their Minor van and arranged food and drinks with the pub. A friendly evening ensued as we started to get to know each other (this was the first time I'd met any of them), then we posed for photos outside the pub, and the locals led me via a complicated back route that bypassed the blocked road to a byway that they said would take me right to the hostel. Unfortunately for Fenchurch the byway quickly turned into a badly overgrown green lane that wasn't wide enough to get through without bushes scraping along both sides, and at one point a tree branch caught her aerial and ripped it off. It did get me to the Youth Hostel though, and I just managed to slot into the only parking space left. I spent the next couple of hours finishing off a novel before I headed up to my dorm to find that the World Snoring Champion had arrived while I was out. It wasn't just the extreme volume that was annoying, it was that he kept randomly varying the noise pattern through whimpering, moaning, hissing, sucking, gurgling, and full blown chainsaw rasp. I did eventually get to sleep somehow, but when I got up in the morning I found that another chap had given up and moved his bedding out into the corridor. Is it just me or does it seem a trifle selfish to stay in dormitory accommodation when you have a medical condition that keeps everybody else awake? At breakfast on Thursday I got chatting to a New Zealander who had owned several Minors. Apparently they're still very popular down there, but replacement Traveller wood is difficult and expensive to obtain. When I went out I found that the coach firm was in the process of trying to get their coaches back out of the car park, and in doing so they had blocked me in. During the half hour I spent waiting for them to shift the coaches out of my way I managed to bodge half of the aerial back on and do several bits of maintenance. Luckily the main road was open again, because I really didn't fancy going back up the byway I'd battered my way through the night before. I had a quick run down to Land's End and was the first to arrive. The sky was blue and it was shaping up to be a hot day, so I got my deckchair out, put some sunblock on, opened Fenchurch's bonnet, and sat in its shade. Neil was the second to arrive in his green Traveller, followed by Bill and Lesley in their Rose Taupe convertible, and Victoria and Onne in Victoria's four door saloon, which looks black at first glance but is actually an extremely dark green (not a standard Minor colour). Fenchurch was running fine but Neil's exhaust had broken off at the manifold and Victoria's back axle was rumbling slightly. Once the official photographer arrived, we all jockeyed into position in front of the special sign and paid to have a set of photos taken. Neil led the convoy as far as Launceston, where his wife Stephanie and poodle Honey joined us at a supermarket. For the second stage I led the group as far as Taunton services. Nobody had mentioned to me about how you're supposed to drop back if the person behind you drops back and it will eventually filter through to the leader, so I spent the whole time trying to keep all four cars behind me in view, not entirely successfully because Neil was at the back and he kept dropping behind lorries. When we finally pulled into Taunton services, Neil's car spluttered to a halt. He opened the bonnet and started trying to tighten the fuel hose clamps because he could smell petrol and thought it was leaking. It turned out that the carb was flooding because the needle valve wasn't shutting off properly, and the engine wouldn't start and run properly again - I don't know how he made it as far as the services because the air filter was absolutely soaking in petrol. We spent two and a half hours in the baking hot sun trying to fix it, before eventually leaving Neil behind to call the AA and get them to tow him to the home of another MMOC forum member who Onne thought would have spare carb parts and a stainless two-piece exhaust (the original plan before Neil's breakdown was to buy a new exhaust at Birmingham and fit it at the side of the road). We had many miles yet to go that day - I was still less than half way to where I was staying in a camping barn near Buxton. When the others stopped a couple of hours later for dinner I kept on going, increasing my speed to make better time. It was going dark when I finally reached Underbank camping barn, which was empty apart from me. I parked on a small grass verge next to the front door. The warden had said the barn was unlocked, but it took me a few minutes to work out that he meant the back door, not the one next to the road, and you have to go through a gate and down some steps to reach it. When I got inside I glanced at a thick folder they'd left with instructions for guests, and spotted a note that said something like, "Please park in the yard." The only yard anywhere near the barn appeared to belong to the farm next door, but I decided to follow instructions and move the car down to it anyway. "Spartan" is probably a reasonable description of the place. It had electric lights (on a meter that needed to be fed pound coins), a toilet, cold running water, a fridge, a table with bench seats, and not much else. On unpacking my stuff from the boot I discovered that a full tub of butter I'd bought the day before had melted and run over pretty much everything. For dinner (at about 10PM) I had boiled hot dog sausages on dry bread and a cup of tea made using milk that had churned itself to buttermilk in the flask, then I pumped up my airbed and settled down to sleep. On Friday morning I cleaned the melted butter off everything and repacked all my stuff. I was putting my bedding in the boot and considering whether to have a bite to eat before I left, when a lady in a dressing gown came out of the farmhouse next door and shouted at me for parking in her yard. Not wanting to cause a scene, I apologised profusely, quickly loaded the rest of my stuff into the boot, and scarpered before she spotted any oil stains. I arrived at Knutsford services well before everyone else, so I popped in for a spot of breakfast and was shocked when it cost me nearly a tenner - more than I had paid for the previous night's accommodation. I later found out that Knutsford is only a few miles from where a couple of friends live and I could have visited them instead. Back outside, I set about doing various maintenance tasks - topping up the oil, cleaning the windows, etc. I was worried the battery might be overcharging because there were some yellow deposits around the breather vents, but there was still plenty of water in the cells and the charging voltage wasn't too high. Ray appeared in his pickup, then immediately disappeared again to fill up with petrol. I think he's used to faster-paced rallies where you stop at each checkpoint for as little time as possible. Bill, Lesley, Victoria, and Onne arrived a bit later, and Neil wasn't too far behind, having successfully fixed both carb and exhaust the previous night. We had a fast and uneventful run up to Scotland. Ray left us again at some point in the afternoon because he was staying much further North than the rest of us. Neil, Stephanie, and I all wanted to see the Forth bridges, and it transpired that Victoria and Onne hadn't seen them either, so we decided to all go via the Forth Road Bridge in convoy. I made a bit of a fool of myself shortly afterwards because when we turned off the M90, Neil carried on. I thought he'd missed the turning by accident, so I flashed my lights at Victoria (who was leading) until she pulled over, only to be told that Neil had deliberately split off at that point because they were staying in a different location to the rest of us that night (he had told me, but I'd forgotten). I stayed that night in Glendevon Youth Hostel, which was a really nice place that I'd like to visit again some time. Its only real drawback is insufficient parking - there's only room for three cars to park abreast, but there were already eight cars there when I arrived, and another four came after me. That was pretty much the absolute limit - I don't think they could have got another car on without blocking the track next to the car park, and all the stacking meant big problems if somebody several cars in wanted to get out. It was during Friday that the effects of driving for many hundreds of miles in standard Minor seats really started to take their toll on my lower back, so after dinner I had a quick shower and then went to bed very early in the hope of giving my back some rest before the next big push onwards. I got up early so I could have some breakfast then go out and find a supermarket before I met up with everyone else (apart from Ray) at Perth. That was when I discovered that Fenchurch had been blocked in by somebody who arrived after I went to bed. He eventually got up and moved his car for me, and despite the delay I still managed to find a supermarket, do the shopping for everyone (holding all the shopping lists in my head was like playing Kim's Game), fill up with petrol, withdraw some cash from an ATM, locate some 20W50 oil (surprisingly rare - most petrol stations don't stock it), and get to the rendezvous before everyone else. A bit of maintenance ensued, including tweaking Neil's carb mixture because it didn't seem to be running quite right, then we set off up to John O'Groats. I believe Ray joined up with us again after Inverness, and we stopped for lunch at a roadside cafe shortly afterwards. A fast run up the coast followed, and we made it to John O'Groats with plenty of time to potter around the tourist shops, write postcards, take some (unofficial) photos in front of The Sign, text an update to my blog, and have a long chat over tea and coffee. The weather had turned a bit foggy, and it started to drizzle a bit when we arrived at the ferry terminal. The trip over to Orkney was nice and calm but the view from the deck was a bit unimpressive due to poor visibility. The car deck was completely full - they probably couldn't have squeezed anything else on. Because we were among the first to arrive and the ferry only had a ramp at the back, we were nearly the last off. Kevin had come out to meet us and I think he was getting a bit worried by the time we finally appeared. A chap had also come out to meet us from the Orkney Vintage Club in his very shiny splitscreen convertible, and he apparently thought we'd missed the ferry because it took us so long to appear. We all went in convoy to the Italian Chapel - a remarkably ornate church made from two Nissen huts by Italian POWs in the second world war, who were posted on Orkney to build barriers that joined some of the islands together and also blocked off the waterways to German U boats. After that, Neil, Stephanie, Bill, Lesley, Victoria, and Onne went off to find their accommodation while Kevin led Ray and I to his farm where he had graciously offered to provide us with a space to camp in a corner of one of his fields. I wasn't expecting him to feed us too. It seemed to be getting dark, so I said we'd better hurry up to the field and pitch our tents, but Kevin reassured us that it doesn't get properly dark on Orkney until about midnight at that time of year. We spent quite a while chatting to Kevin and Jane and getting to know their three large dogs, and I think it was about 10PM by the time Kevin showed us his rather decrepit Range Rover and told us something like, "you turn right, go up the lane, turn right at the gate, and you'll know you're in the right field when you see a Land Rover." We turned right, went up the lane, and couldn't see a gate or a Land Rover. We kept going, and going, and eventually ran out of lane. Then we went back a bit and found a gate, but it was wired shut, so we went back some more, found another gate, drove around a field, and couldn't find a Land Rover in it. We heard a faint shout from a distance: "You're in the wrong field!" Went further down, found another gate, went in it, drove around, STILL couldn't find a Land Rover. Eventually we got almost back to the farmhouse, and Kevin came out and showed us where the correct track was - we'd driven straight past it in the dark. By the time we found the field with the Land Rover in it, it was completely pitch black, probably due to the heavy cloud cover, so we wound up pitching the tents by torchlight. Afterwards we headed back down to the farmhouse, where we found that Neil had arrived while we were away exploring the countryside, and was again fiddling with the mixture setting on his carb. We soon managed to get that set right, but then Ray said, "it'll probably stall now," and it did! Turns out the fuel pump points were pretty much completely burned away. Luckily I was carrying a spare set (actually two - a single contact type and a dual contact type). Neil fitted the top half of the new points and that was enough to get it running again (changing the bottom half too is rather more awkward and it was getting very late). While we were working on that, Jane fried us up some bacon butties for supper, and then we stayed up chatting till the early hours of Sunday morning. After we eventually got back up to the tents, I still had to do some unpacking and pump up my airbed, so it was very late indeed by the time I got to sleep. I think I woke at about 7AM as usual on Sunday morning and strolled down to Kevin's Crofter's Cottage, which he's part way through restoring. I tried to creep into the house quietly, thinking Kevin and Jane might not be up yet, but the dogs immediately spotted me and announced my arrival as loudly as possible! Jane set about cooking us all a very fine breakfast (much better than the overpriced one I had in Knutsford Services). A bleary-eyed Ray appeared just in time for the food. After breakfast, Kevin decided it was time for us to see the ancient Standing Stones of Brodgar. Unfortunately it had started raining again and we all got rather wet. After getting back to Kevin's and drying out a bit, we drove over to the auction site at Kirkwall where Orkney Vintage Club was holding their annual rally. Everyone else had arrived before us and arranged for us all to be parked in a row, lined up in age order. I was surprised to realise that Fenchurch was the oldest car in the LEO run. I was slightly disappointed to be given entry number 44 rather than 42, which belonged instead to a Sinclair C5. It rained on and off for most of the morning, a fact which must have annoyed many of the people who brought pristine examples of vintage open-top cars along to the show. I had my first experience of exhibiting a car, and of driving around the show ring. I'm not sure that it's something I'll be making a habit of - driving the things on the open road in the way they were intended is much more entertaining to me. We posed for one last group photo (which I don't have a copy of), then Victoria, Onne, Bill, and Lesley left to stay with family on the islands. I had a bit of a drive around the mainland (as they call the largest island in the group), saw some scenery up on the North West coast, and bought some real ale brewed on Orkney to take home as gifts for my parents. I drove back to Kevin's, where Ray still hadn't left yet despite planning to catch the next ferry. I'd arranged to meet up with Neil and Stephanie a bit later, so I pottered about a bit, bringing as much as possible of my camping gear back down from the field so I would be able to carry the rest down in the morning and wouldn't have to bother with the Range Rover. Dinner was at a slightly posh (by my standards) hotel called The Merkister where I ate some rather nice roast lamb and spent a pleasant couple of hours chatting to Neil and Stephanie. They were booked to catch a later ferry than me, so I didn't expect to see them again on this trip. When I got back to Kevin's I went up to my tent, fully intending to get an early night, but wound up spending nearly an hour sat on the bumper of Kevin's Land Rover watching the sunset (it sets very slowly at those latitudes in summer). I was hoping it would get fully dark before long so I could take a look at the stars and watch for the Perseids, but I eventually had to give up and go to bed. I was up very early on Monday morning because I had get my tent packed and then drive for over half an hour to get to the ferry terminal by 07:20. Despite this Kevin and Jane were already up when I got down to the house. They can't have got much sleep because apparently their oil-fired range backfired at 2AM and blew all its doors open, filling the kitchen with smoke and soot! Jane said she went outside after that happened to see if the Perseids were visible, but she couldn't see anything through the clouds. After saying my goodbyes I made a spirited run down to St. Margaret's Hope. This set the pace for the day because I had a long way to go and, being on my own again, I didn't want to go by the quickest and most obvious route. The air was clear so there was a good view of the islands from the ferry, and it wasn't as full as on the way over. As a result of trying to not fill up in the highlands where the petrol was more expensive, I miscalculated how much I would use and wound up stopping at four different petrol stations during the day. At one of them I was approached by another old New Zealander bloke who wanted to chat about Minor Travellers, or "Woodies" as they apparently call them down there. He seemed very impressed that Fenchurch still has all her original wood with no rot. The route I took was similar to that we used on the way up until I got to Inverness, at which point I headed South West across the country. I honestly didn't realise this would mean going past Loch Ness - it isn't shown on the overview map I was navigating by. It took absolutely ages to get past the Loch because the road was full of slow-moving tourists in big white motor homes, and it's so narrow and winding that there was rarely an opportunity to overtake. Normally this wouldn't bother me too much, but I was very conscious of the ticking clock and the huge distance I had yet to cover - Youth Hostels tend to shut their doors around 10-11 PM, and if the rest of the route had been as slow as the road past Loch Ness I might not have got there in time. The roads cleared up after Fort William and I picked up the pace to make up for lost time. The scenery around Glen Coe was stunning and I'd like to go back there sometime and view it at a more relaxed pace. Shortly after Crianlarich something odd happened - I pushed the throttle to the floor and Fenchurch slowed down. I popped her out of gear and watched the rev counter drop to zero. A couple of hundred yards ahead on the flat road was a layby, so I indicated left and let myself gradually coast to it. My first thought was that the fuel pump had probably got stuck, and I was right. A quick tap on the pump and she started up again on the first pull. I took the lid off and tried to clean the muck off the contacts with a bit of paper, but on closer inspection I could see there weren't really any contacts left - they'd pretty much completely burned away. There wasn't much I could do about it short of trying to cannibalise my spare fuel pump (which was in need of a new diaphragm), so I shrugged and carried on. I needn't have worried because she got me all the way to the Youth Hostel at Minigaff near Newton Stewart without so much as a hiccup. The Erskine Bridge near Glasgow was rather more spectacular than I expected, partly due to the changeable weather. I knew Tuesday was going to be a much more relaxed day than Monday, so I lay in until nearly 8, had a shower and made some breakfast, did a bit of maintenance on Fenchurch, and didn't leave the hostel until about 9:30. The plan was to drive the short distance down to Wigtown to visit Marion and Richard Van der Voort who run At the Sign of the Dragon, a Science Fiction bookshop. I'd met them at SF conventions and I'd promised to come and visit when I had a chance. When I got there I saw a sign on the gate saying they don't open until 11AM, so I drove on into the centre of Wigtown itself where it looked like very little had opened yet, so I carried on South with the vague idea of trying to find the most southerly point of the peninsula. On the way I saw a tourist sign advertising "St. Ninian's Cave." As a lapsed caver myself, I couldn't resist taking a look to see what this was about. From the car park it was a fair walk (over a mile) down through woods to a rocky beach. The cave itself was disappointing - it's a tiny little sea cave with a lot of graffiti and improvised crosses on it. Apparently legend has it that a saint might possibly have once lived there for a bit a few hundred years ago (though I can't imagine it would have made a very good shelter unless it's got a lot smaller over the centuries). It would seem that Christians often go there on a religious pilgrimage. I was happy enough just to have a pleasant walk through some nice countryside and along a deserted beach covered with interesting rocks. Back up north to Wigtown and At the Sign of the Dragon. I had a bit of fun getting through their gate without letting their cheeky Cairn Terrier out. I met Richard inside, who said that Marion was confined to bed with a nasty cold. Due to a slight misunderstanding, he spent the next hour thinking he was talking to the new head of publicity for Orbit Books, the Science Fiction book publisher, rather than Orbital 2008, next year's Eastercon. I did wonder why he kept telling me anecdotes about publishers! I managed to limit myself to buying four books by the tactic of only spending the £15 worth of Scottish notes I had left in my wallet. One of the books I bought is a paperback copy of Alfred Bester's excellent novel, Tiger! Tiger! - published in the UK in 1967 by Penguin Science Fiction, before it was rereleased under the title The Stars My Destination - with a beautiful cover illustration by Alan Aldridge. After chatting to Richard for a couple of hours about conventions, Morris Minors, book translations, East Germany (! ), the postal system, etc. I said goodbye and set off home. About a quarter of an hour later Fenchurch's petrol pump cut out a second time, again in easy coasting distance of a layby. I gave the fuel pump points another quick clean with paper and carried on going. Never one to choose the easiest route, I left the M6 at Penrith and headed West on the A66 to Keswick, then drove down past Windermere and through Kendal. Another very touristy area, and I got stuck behind a very slow-moving coach for a while. Fenchurch's fuel gauge was showing empty, but I know from experience that there's more than ten miles worth of reserve fuel capacity, so I kept going past the next couple of petrol stations, hoping to put the coach well behind me before I stopped. At the third petrol station I saw, I pulled off and filled up, and as I was doing so, I noticed a green Traveller parked behind the station with its bonnet up. Incredibly, it was Neil and Stephanie, who I'd last seen a couple of days and several hundred miles ago on Orkney. They were going to and from different locations at different times by a different route to me, yet our paths just happened to cross again. I pulled over next to them as coolly as I could manage, and said, "We have to stop meeting like this." Perhaps Fenchurch really does have an Infinite Improbability Drive! Neil had stopped to try adjusting his voltage regulator because he thought it was failing to charge the battery at low revs. I offered him some new dynamo brushes from my big box of spares, but he said he was sure they were fine, so I said goodbye to them for the second time and carried on my way. I kept going on the A65 to the Yorkshire Dales. This was home territory for me, and I could finally put the map away and navigate the rest of the way home on autopilot. It started to rain very heavily after Kirkby Lonsdale, and by the time I stopped at Settle for dinner it was absolutely torrential, with floods of water running across the roads. I had fish and chips at a little cafe, and very nice it was too. The rest of the trip home was pretty unremarkable apart from the rain, which continued unabated until I was nearly home. 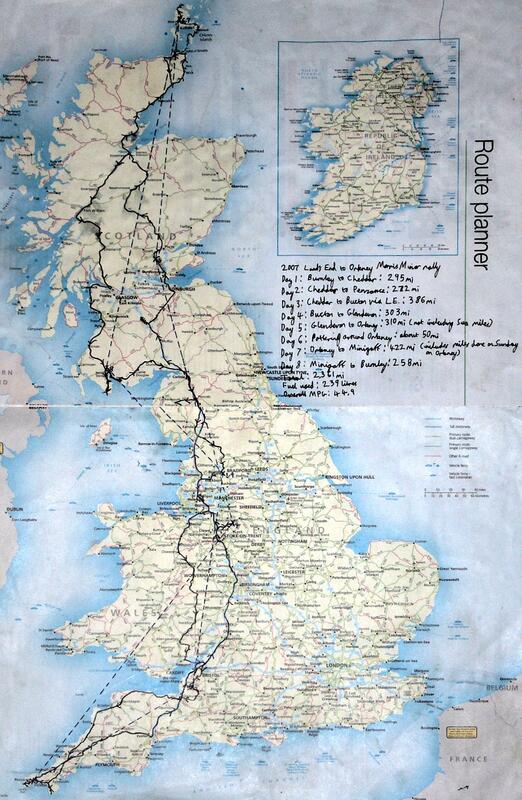 Here is the rather scruffy road map I used while planning each day's route (click on it for a larger version). There's a mistake where the two pages meet but I can't be bothered to fix it now (the line should go from Keswick to Kendal, not from the M6 to Kendal). So, after covering 2361 miles in just over a week in a 44 year old car, what conclusions have I reached? A well-maintained Minor is well up to the challenge of a long road trip. The only two breakdowns Fenchurch suffered were the result of a worn out fuel pump component that I had already bought a replacement for, but which I'd run out of time to fit before I left. I've since rebuilt my spare pump and fitted it, and I expect it to last for many years without further attention. The 1098cc engine is well capable of keeping up with modern traffic without thrashing it excessively. I only really wished for more power when I was trying to overtake motor homes on the narrow windy roads around Loch Ness. The standard drum brakes are perfectly adequate providing you make good use of engine braking on long/steep hills - I didn't manage to fade them once, even on the 1:4 Porlock Hill. On a long run, a Minor with a good condition well tuned engine is capable of fuel consumption figures that are the envy of most modern cars. I managed an average of just under 45 miles per gallon over the whole trip. I was a bit nervous beforehand, never having done such a long trip in a classic car before, but I would happily set off on another long trip in Fenchurch tomorrow. The biggest problem I encountered was that the standard seats are OK for a while, but after several days of driving all day long they start to take their toll on you. I wouldn't want to do another trip as long as the LEO run without upgrading to more comfortable seats. My perception of distance is surprisingly flexible. When you're restricted to foot travel, a couple of miles seems like a long distance. On public transport I would happily go as far as Manchester because I could get there with a single bus journey, but further afield than that was a bit of a hassle, and getting to an out of the way destination could be a major headache. I once attempted to plan a trip to a small rural town 20 miles away on buses and eventually gave up because it was going to take at least three changes and I couldn't find copies of all the relevant timetables. When you have a car but only tend to use it for a ten mile daily commute and occasional trips out in the local area, a 100 mile trip is a major excursion. When you set out on a trip like the LEO run, the first stretch seems dauntingly long, but you quickly get used to doing over 300 miles a day, and now I've got back home I find myself looking at the map and saying things like, "Oh, that's only 150 miles away, I can get up early and pop down there in the morning." What I'm getting at is that the experience of driving such a long distance in a short space of time has shrunk the size of the country in my perception. Whether this effect will last remains to be seen. Great Britain is a big place. When you compare it to somewhere like Russia on an atlas it looks tiny, but driving at high speed for hour after hour, day after day, to get from one tip of the island to the other gives you a better idea of the true scale of the place. Not only is it big, but the vast majority of it is still covered in green stuff (fields and trees). We have an awful lot of coastline too. It might be fun to do a "round Britain" tour, following coast roads as much as possible, but I can't see myself being able to take enough time off work to do it any time in the foreseeable future. It's much more fun driving on lesser roads than on motorways, but it can add a lot onto your journey time, particularly if you get stuck behind a motor home or something and the roads are too narrow and winding to be able to see far enough ahead to overtake safely. Popular tourist areas are particularly bad for this - the road around Loch Ness, and the roads through the middle of the Lake District took much longer than I expected because of all the slow-moving tourists. It hasn't put me off using A and B roads in preference to motorways, at least when I'm out sightseeing as opposed to just trying to get from A to B as fast as possible, but I need to remember in future to watch out for popular tourist spots and allow more time to get through them. A decent stereo and something to listen to on it is a big help in retaining your sanity when you're driving for many hours a day, especially if you don't have a passenger to talk to. Nearly everyone else on the run commented on my stereo and asked about how I'd fitted it and where the speakers were (fitting a stereo and speakers to a car that wasn't built with standard mounting locations for them is easier said than done). As well as quite a lot of Radio 2 (I was glad I managed to partially fix the aerial even if the reception was less sensitive than it was before it broke off), I listened again to the entire radio series of Hitchhiker's Guide to the Galaxy. It seemed appropriate considering Fenchurch is named after a character in the series. Bill is planning to organise a second Land's End to Orkney rally next year. I've said I might go if it's substantially different in some way - for example if it takes a more interesting route. I'm not the type of person who likes to go back to the same holiday destination year after year, and the second LEO would have to offer something extra to entice me back again. Meanwhile I've been putting some serious thought into bringing to reality a trip I've wanted to do for several years - a tour around Ireland. I've decided that instead of going it alone as was my original plan (before I got back into Minors), I'm going to try organising it as a Minor rally that I'm calling the AIR - the Around Ireland Rally. If this idea comes off it will be sometime next year, probably in the summer, and I'd like it to take about a week like the LEO. See also my photo album of the trip for many more pictures that weren't included in this report, and the Morris Minor Owner's Club Forum topic where the trip was planned and discussed. ETA: I've locked comments on this entry because it kept receiving anonymous spam. You're welcome! I've been thinking that the next time I do a long road trip I'll try to get hold of audiobooks of The Hobbit and LotR and listen to them on the way. Those stories are special to me in part because at their core they are all about a great journey. There and back again. We occasionally listen to the BBC versions, or to Rob Inglis' reading. They are, indeed, Good for Journeys!